Eagle Communications Inc. is a Kansas-based Broadband Services and Media Company with over 280 employee-owners. The company operates 28 radio stations in Kansas, Nebraska and Missouri, as well as broadband systems in 60 Kansas, Nebraska and Colorado communities. The company also offers e-business solutions, web hosting, telephone service, high-speed internet, and wireless internet in most service areas. For more information log on to www.eaglecom.net. Disclosure: Eagle Communications is the parent company of North Platte Post. Eagle Communications announced today the promotion of Mark Trotman to Vice President of Radio, effective immediately. Trotman has served as Eagle’s market manager in Hutchinson since 2010. He will now focus on coordinating the company’s revenue development, sales training and additional processes for Eagle’s 28 radio stations. With Trotman’s promotion, sales manager Terry Drouhard will now serve as market manager in Hutchinson. Drouhard was appointed to operations manager in Hutchinson in 1989 and promoted to Sales Manager in 1996. Eagle Communications announced today that Executive Vice President and Chief Operating Officer Kurt K. David has been promoted to President and Chief Operating Officer, effective immediately. David has served as Chief Financial Officer at Eagle Communications since 2006 and has worked as part of the financial services and communications industry in Kansas for over 25 years. Gary Shorman will continue as Chairman and CEO of Eagle Communications and President of the Schmidt Foundation. David earned an undergraduate degree in finance and management from Kansas State University and a master’s of business administration from the University of Kansas. He also has a master’s of agribusiness from Kansas State University. He has held officer and leadership positions with the Ellis County Coalition for Economic Development, Heart of America Development Corporation, Rotary and the Ellis County Historical Society. David is also Past Chair of the Kansas Cable and Telecommunications Association. He is an avid triathlete competing locally, regionally and at the World Championship level. David and his wife Kathy have two children, Hayden, Olathe, and Jennifer, New Orleans. In addition to David’s promotion, the Eagle Board has promoted Travis Kohlrus to Vice President of Eagle Broadband Division, which provides TV, internet, phone, as well as technology and marketing solutions in over 60 communities across Kansas, Nebraska and Colorado. A native of Ellis, Kohlrus joined Eagle Communications in 2003. He was elected to the Eagle Communications Board in April 2017. Kohlrus and his wife Susie have two children Tanner, 14, and MaKenzie, 11. North Platte Post is a division of Eagle Communications. Radio Ink magazine is known for world-famous lists. In April, they published a list of Radio’s Top- 20 leaders. It includes Eagle Communications’ President Gary Shorman. “These are the radio industry’s best. They know how to motivate their teams to success. They are winning at sales, programming, and management. 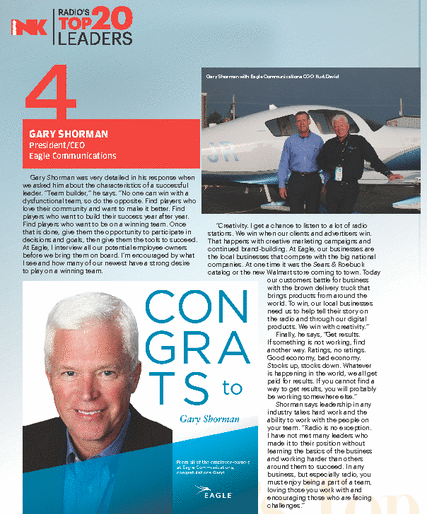 Gary Shorman was very detailed in his response when we asked him about the characteristics of a successful leader. “Team builder,” he says. “No one can win with a dysfunctional team, so do the opposite. Find players who love their community and want to make it better. Find players who want to build their success year after year. Find players who want to be on a winning team. Once that is done, give them the opportunity to participate in decisions and goals, then give them the tools to succeed. At Eagle, I interview all our potential employee-owners before we bring them on board. I’m encouraged by what I see and how many of our newest have a strong desire to play on a winning team. “Creativity. I get a chance to listen to a lot of radio stations. We win when our clients and advertisers win. That happens with creative marketing campaigns and continued brand-building. At Eagle, our businesses are the local businesses that compete with the big national companies. At one time it was the Sears & Roebuck catalog or the new Walmart store coming to town. Finally, he says, “Get results. Shorman says leadership in any industry takes hard work and the ability to work with the people on your team. JEFFERSON CITY, Mo. (AP) – Analysts say Missouri Gov. Eric Greitens could find a political revival challenging, especially in a #MeToo environment where he would be vulnerable to attack for allegedly taking a compromising photo of a woman during an extramarital affair. He is stepping down Friday amid allegations of sexual misconduct and campaign violations but is still defiantly asserting that he’s done nothing worthy of being forced out of office. Even though he’s quitting amid scandal, some Greitens voters said they still like him. Retiree Wilma Nelson said she would be open to voting for Greitens again if he sought to re-enter politics.